At 3am on Friday, September 9th, one of my sons and I awoke to place orders for my extended family's iPhone 7 Plus upgrades from iPhone 6 Plus. Despite getting all the orders completed from 3:18am to 3:43am, the estimated delivery wait times ranged anywhere from 1 week to 3 months, depending upon color and capacity. My 256GB phone turned out to be estimated to arrive on launch day, Friday September 16th. Awesome! 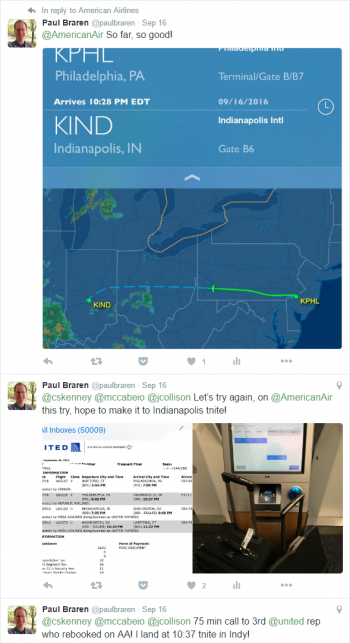 Only problem was that I had a flight that same Friday, at 10am, well ahead of residential UPS deliveries. I was happily heading to Indianapolis for the 6th annual Home Server Show #BestMeetupEver, which is now called RESET by the way. Turns out you have to sign for these things, or preauthorize them to leave this small package rather conspicuously on your front step. Also turns out you cannot reroute UPS packages out-of-state, even with UPS My Choice Premium. Only to nearby neighbors. So I was not going to be able to use my new phone at this event. Oh well. Obviously, better safe than sorry. Nobody complained, as we quietly deplaned. These things happen. Once we all were back in the waiting area, we were repeatedly and sternly told to wait to hear our name called, no need to wait in line. That way, we could work with the gate attendant to rearrange our itineraries, and let them know our checked baggage plans. And we wait. Three hours go by. 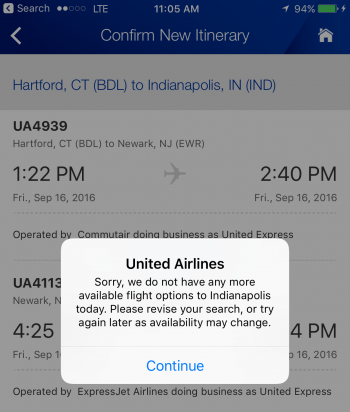 Attempts to re-book through the app don't work out so swell. Nor did phone calls. Hmmm. The first two phone representatives that I reached failed to find a way to help me. So I canceled the whole trip, since they couldn't get me anywhere Indianapolis until the middle of the next day, which would cause me to miss most of the conference I was flying to. I tweeted my disappointment, and gave my family a heads-up that I'd be texting them for a ride back home soon, once I was able to retrieve my luggage. Oh well. 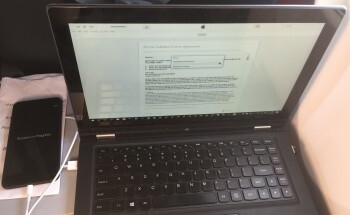 While waiting for my luggage, I realized I had no travel voucher negotiated, emailed, or printed. Oops. So I called back in. Not only did that representative stick with me for 75 minutes, talking me through a way to get my the United front desk staff to ask for my luggage to be pulled off the tarmac almost immediately, but he also found me a seat on another airline. At no charge! This kindness completely saved the day for me. Third time's the charm! Now I had 4 hours to kill until my next airline's attempt to fly me there. Well, just so happens I had asked my parents to help with receiving the iPhones. And luck would have it they got a delivery just moments before I contacted them to let them know I was flying after all. So it turns out their airport pick-up trip became a hand-delivery iPhone tip, with a stop at a nearby Friendly's to enjoy some time and ice cream together. Sure beat sitting in the airport alone, after having hung out there for over 6 hour already. My family is awesome. A couple of hours later, back at the terminal waiting alone for my new evening flight, it was time to get out the sync cable quickly, and do a local backup with encryption using iTunes. I didn't have my usual laptop with me, so this took a while. In-flight restore not recommended, but I did make sure my laptop was charged. Yeah, that's a barf bag, doing duty as scratch protector, until I had a chance to get a case at the Apple Store the next day. Just as we were about to leave the gate, the sync finished, so I activated the iPhone 7 Plus, with the Verizon LTE service immediately moved over. Put them both into airplane mode, then we took off. Once airborne, I restored from backup, and ta-da, had myself a working iPhone 7 Plus that received its first call soon after landing. Of course, a lot of apps that needed re-hydration still, but that could wait until I got to my hotel in Indianapolis. A lot of the migration tips were from my own migration tips, from the last time I went through this process. Next morning was Saturday, and I arrive at the Microsoft Corporation location of the meetup. 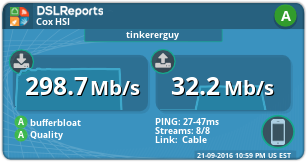 Alas, we eventually find ourselves some fast internet. I quickly started to get a sense of just how much faster this new iPhone is for doing stuff. Like, any stuff, like opening up frequently-used apps like LastPass, ecobee, and of course, Safari. About 2x to 3x as fast. That's meaningful, and very noticeable. 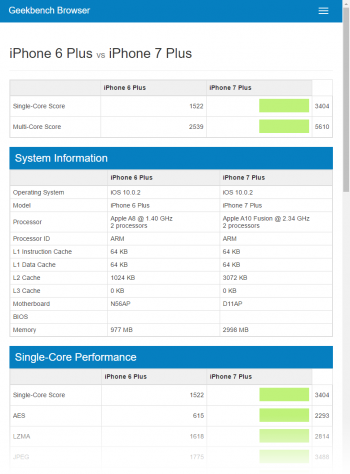 Lastly with the A10, Chipworks’ teardown of their iPhone 7 confirms that it has 2GB of RAM, specifically Samsung LPDDR4. 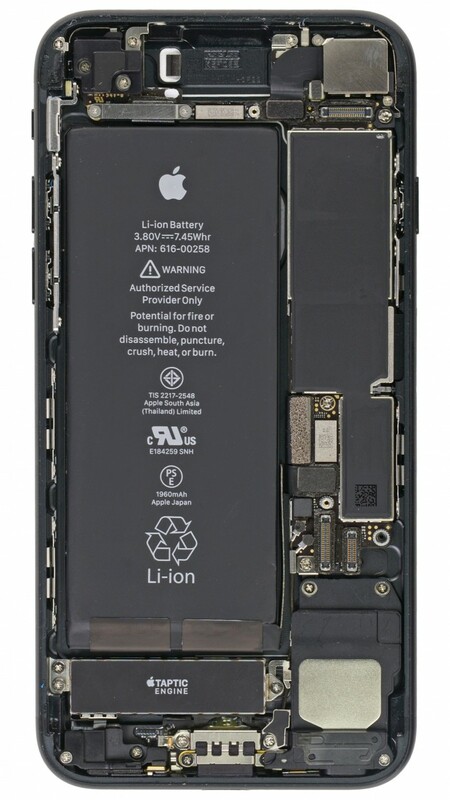 Besides confirming that the memory capacity on the iPhone 7 hasn’t increased versus the iPhone 6s, this is notable because iFixit has found something different with their iPhone 7 Plus. In the case of the larger phone, there is 3GB of RAM. Apple has never before equipped the Plus with more memory than the base model, so this is a first. The WiFi / Bluetooth socket has been won by Murata with a module part number 339S00199. These modules have historically been multi-component packages. We will decap it to find who wins the Wi-Fi controller and verify who else might be within the module. 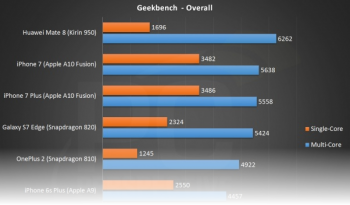 Turns out those speeds and feeds, and Geekbench2 Scores (2372 vs. 3618), really do translate to some pretty spectacular performance gains in everyday use. 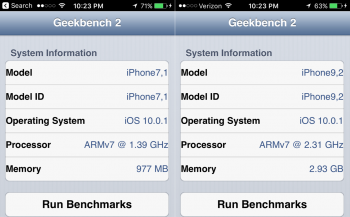 The latest is Geekbench4, available on iTunes. iPhone 6 Plus at left, iPhone 7 Plus at right. iPhone 7 Plus. 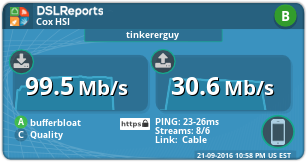 The ~300 Mb/s speeds were obtained on subsequent retests [+/- 10%] too. The results shown above were obtained in the video recorded below. 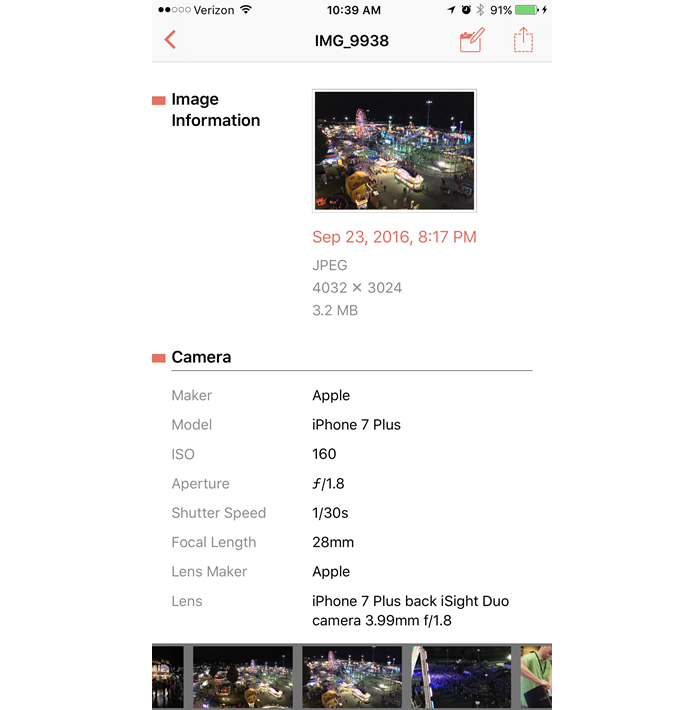 "iPhone 6 Plus versus iPhone 7 Plus - 2x to 3x WiFi and App Performance Improvements Demonstrated" Recorded Sep 21 2016, edited and published on YouTube on Sep 22 2016. This was recorded at 4K at 30 fps on another iPhone 7 Plus, but YouTube Video Editor apparently down-res'd it to 1080p when I made some necessary edits. Image couresty of iFixit. See article above for links to all the full resolution original iFixit images. When in vibrate mode, alerts and calls are very nearly inaudible to those around you, which is good, in most situations. Leaving my 7 Plus in its dock/charger at my desk as I work all day also means I no longer hear those alerts and calls, so I must remember to go into actual ring mode instead. I'm just not getting used to the Raise to Wake function, likely will disable it. 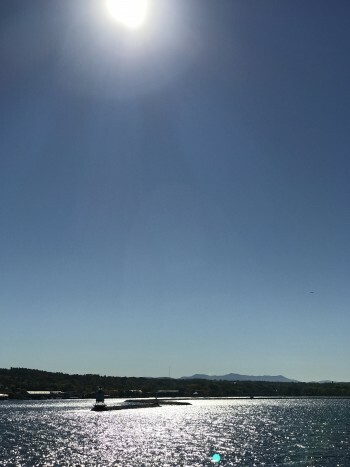 Not a great idea to frame pics with the sun in them, note the circular cyan-colored flare artifact it caused in this iPhone 7 Plus photo, at the diagonally opposite side of the photo. Series of photos by Paul Braren. Those speakers are noticeably louder, especially when pocketed upside down, walking about the house doing chores with podcasts blaring. It's key to keep the ear piece aimed away from my leg, to maximize the volume. The 2x lens doesn't get used in lower light situations at all, unfortunately. This can be easily tested for yourself in an indoor evening setting by covering one lens. 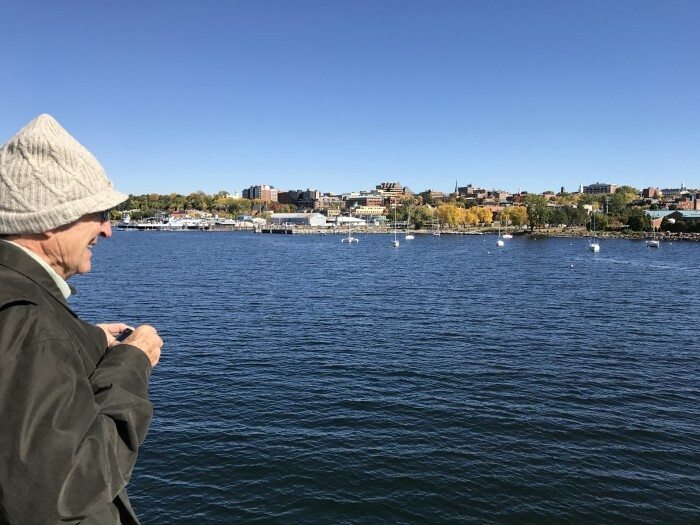 See if your live photo preview just went away. If it does, then cover the other lens instead. There, live preview is back. Now tap the on screen 2x indicator, and you'll see that nothing happens, you're still viewing the live photo preview,despite the 2x lens being covered. If you slide through zoom, you also won't notice the usual slight parallax shift, since it's not changing over to the 2x lens at the 2x spot, it's just doing digital zoom. All that aside, the quality of my pictures continue to delight, even the usual Twitter quality degradation doesn't mess them up too badly, seen here. There is one new artifact I noticed among hundreds of pics seen at right: not the purple, cyan instead. 1x lense example, in Panoramic mode. 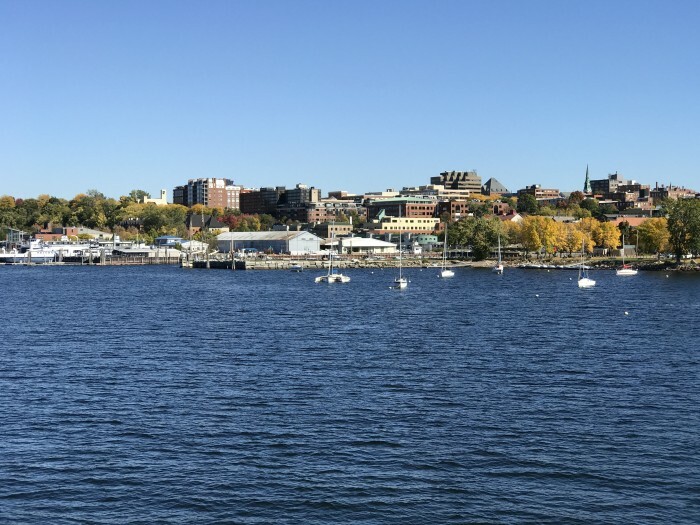 Taken from the Spirit Of Ethan Allen III, heading back to port in Burlington, VT on October 11, 2016. 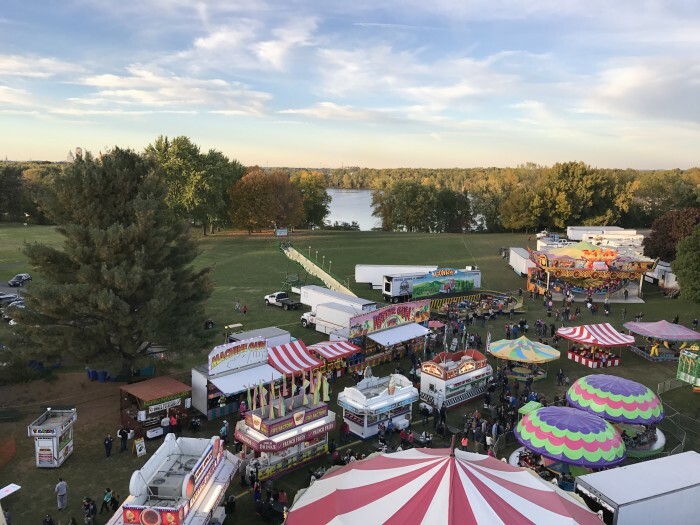 Cove Side Carnival, Wethersfield, CT on October 15, 2016. 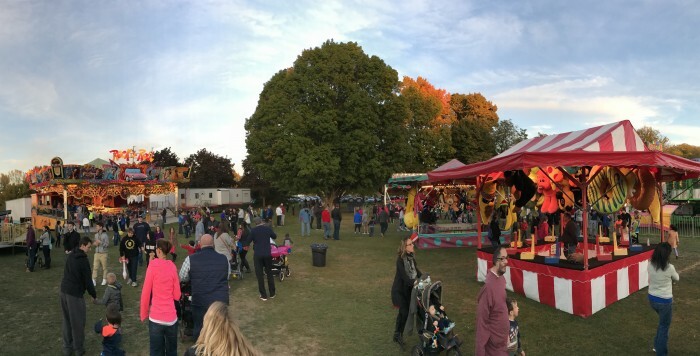 Cove Side Carnival, Wethersfield, CT on October 15, 2016. Motion makes for strange artifacts, but a good color demo. 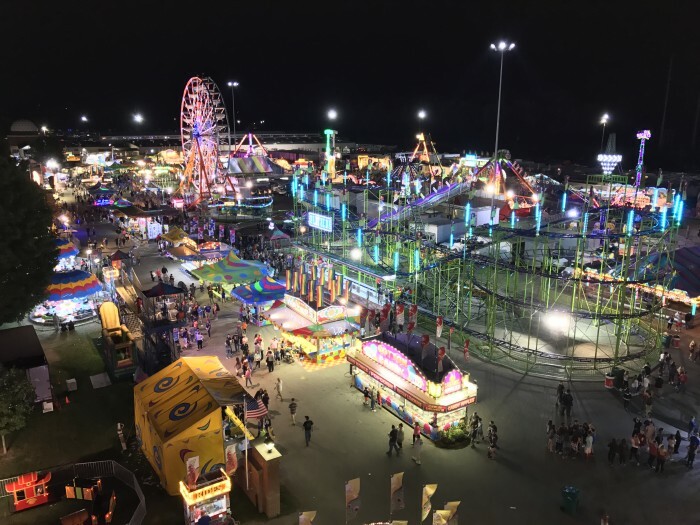 The Big E, September 23, 2016. See Metapho by Zininworks Inc. from the App Store. Apple iPhone 7 and 7 Plus Review: More and Less. So how hard was it to drill the bottom to get the headphone jack? 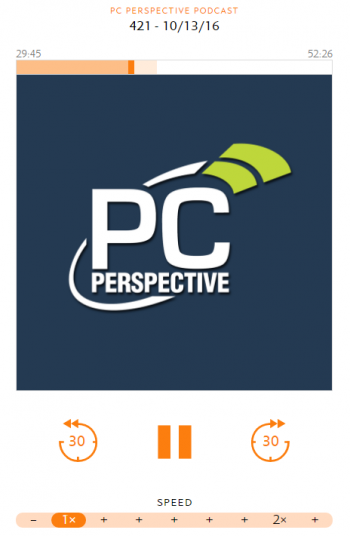 PC Perspective Podcast 421 - 10/13/16, starting right at the beginning of the iPhone segment at 21:45. ...take 'em for a grain of salt, like I don't believe the iPhone 7 is 4 times or 3 times as fast as the Galaxy S7 Edge. 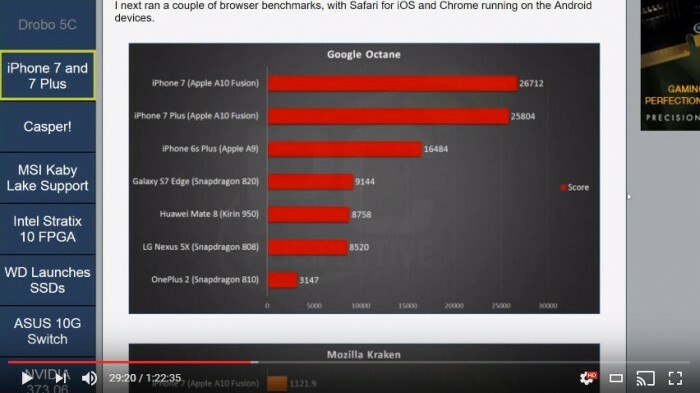 no, and if you're looking at browser benchmarks, that's the most misleading one of all, because Apple has an unparalleled advantage there, because they make the SoC, the operating system, and the browser. So it's being optimized to the points where nobody else can. 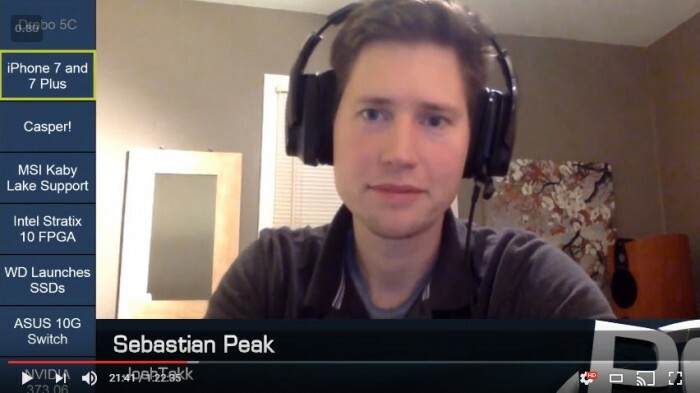 PC Perspective Podcast 421 - 10/13/16, starting right at the iPhone segment about benchmark versus real-world performance at 29:20. PCPer Podcast Audio - iPhone 7 / iPhone 7 Plus discussion begins.